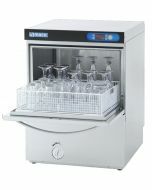 The Asber GT510 glasswasher is a high-power machine designed for the busiest and most demanding bars. Utilising a high-power rinse boiler that can operate at 5.6Kw, it delivers near continuous washing and improved heat up and recovery times compared to other models. Now with a multi-phase electric configuration, the unit can easily be converted between 3 phase and 1 phase hard wired power requirements to suit your sites requirements. 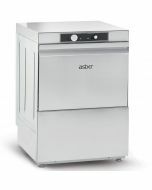 Featuring a built-in water softener, the Asber GT510 has been designed for areas with hard water and operators simply top-up salt from inside the cabinet. 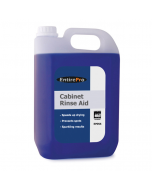 This saves space, minimises maintenance and reduces cost of installation. 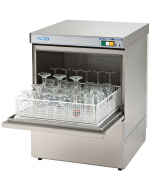 Featuring the latest technology, the Asber GT510 glasswasher features an all-digital control panel. Simplifying use, the digital control panel allows you to select between washing cycles depending on soiling with 90, 120 or 180 second wash cycles available. The digital control panel also shows the temperature display as the machine heats up and completes wash cycles. 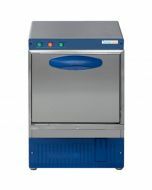 The Asber GT510 glasswasher provides the quickest heat up and recovery times. 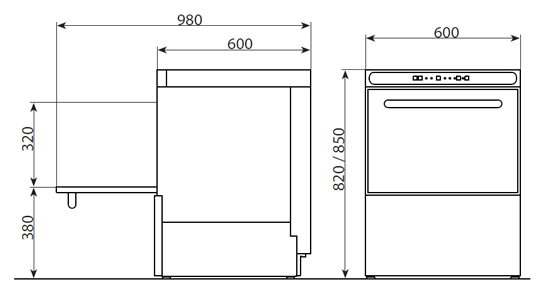 Independent 2.8Kw heating warms a 25-litre wash tank whilst a separate 7 litre rinse booster boiler is heated by a 5.6Kw element. 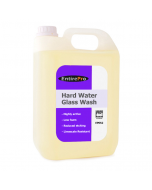 This ensures near continuous washing for the busiest bars and a guaranteed 85c hygienic rinse, even during the busiest periods. Users can monitor temperature using the digital control panel, helping to ensure stringent compliance with health and safety. An anti-backflow device is also fitted as standard to achieve full WRAS approval. The machine can easily be converted between 1 phase or 3 phase power, either at the point of order or by your engineer on site. 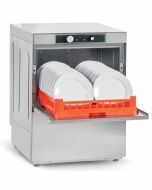 Combining high performance glasswashing with simplicity and practicality in design, the Asber GT510 features rounded tank corners to prevent build-up of grease. A wash tank filter traps prevents debris from entering machine components and all accessories inside the wash tank, such as arms and filters can be easily removed for deep cleaning. Operators can also use the digital control panel to change machine settings, such as chemical dosing or monitor diagnostics information. 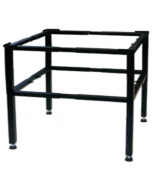 All major components are easily accessible from a removable service panel. Durability is guaranteed thanks to full stainless-steel construction. A promise of quality that is backed by a 2 year commercial warranty. 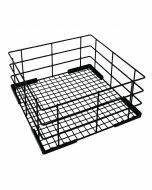 Two 500x500mm glasswasher baskets and 1 cutlery insert is included as standard alongside all waste and water hoses for UK installation. 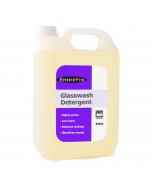 A free chemical pack is available with every Asber Tech Glasswasher. 1 phase or 3 phase hard wired power. 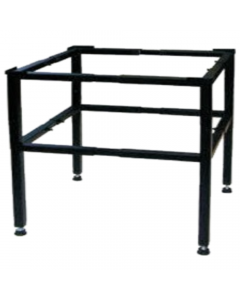 Can be converted to suit requirements at point of order, or on-site by your engineer. Will require specialist installation by an electrician.